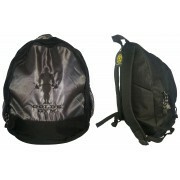 Backpack gym bags allow you to carry bodybuilding clothing easier. Some are a regular gym bag with hidden shoulder straps which can be unzipped and deployed. Others are designed as backpack gym bags but have a handle to carry bodybuilding clothing.